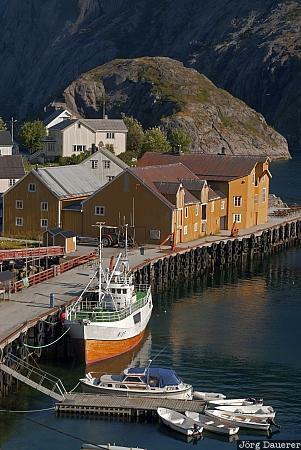 The harbor of Nusfjord surrounded by yellow rorbuer huts and steep mountains. Nusfjord is in the south of the island Flakstadøya which is part of the Lofoten archipelago, Nordland in northern Norway. This photo was taken in the morning of a sunny day in August of 2010. This photo was taken with a digital camera.